Aberdeen has been the proud winner of The Royal Horticulture Society Britain in Bloom Competition 10 times. It first entered the yearly competition in 1964 and won its first award in 1965. Aberdeen then won in 1969, 1970, 1971, 1973, 1974, 1977, 1979 and 1987. To give other cities a chance to win the competition Aberdeen was barred from entering for ten years. However it won again in 1998 and every year thereafter! Touring around Aberdeen it can come as no surprise that The Granite City has won so many times. Roundabouts, road verges, public and private gardens all abound in floral displays and hanging baskets. Walking around the most popular parks of Union Terrace Gardens, the Duthie Park, Hazlehead Park and Johnston Gardens will reward the visitor with some stunning floral displays and colours in peaceful environments. In 2005 Aberdeen City and Dyce won awards at Scotland In Bloom, with Aberdeen taking the best City award and coming second in the Scotland In Bloom award. Previous awards include winning Beautiful Scotland In Bloom Large City category from 1968 - 2005. Aberdeen has won the overall award 20 times. "The residents and visitors to Aberdeen enjoy fine local parks, where seasonal colour and permanent planting complement the impressive collection of mature trees." This was followed with more success in September 2006 when Aberdeen came first in the large city category of the International Cities in Bloom competition in Canada. The International Communities Five Bloom award was presented to Councillor John Stewart during a ceremony at Manitoba on Saturday 23 September 2006. Dyce won for the small town category. Read about the Parks of Aberdeen. On the 25 and 26 August 2007 Hazlehead Park, Aberdeen hosted a celebration of its winning Britain in Bloom over the years called Aberdeen Blooms. This family festival also featured the Royal Horticultural Society of Aberdeen (RHSA) flower show which took at at Hazlehead Park rather than the Duthie Park for 2007. More Information. 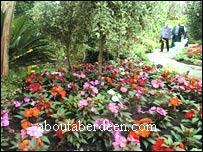 Once more Aberdeen was not allowed to enter Britain in Bloom 2007 because the City has won too many times! However Aberdeen city was still a Britain in Bloom winner when it won the Beautiful Scotland awards for the outstanding cleanliness of Aberdeen city streets, parks and gardens. Aberdeen city first won this title in 1968 and each year since. The Beautiful Scotland trophy was presented to Mr Peter Stephen the Lord Provost of Aberdeen city. The district of Dyce won the Urban Community award. The results to the Britain in Bloom competition were announced at Caird Hall in Dundee Scotland. Union Street and Union Terrace with their hanging baskets, planters and bedding plants particularly impressed the Britain in Bloom judges. They also made special mention to the efforts by Aberdeen City Council to keep the streets clean and litter free. In September 2007 Aberdeen won the International Category for Best Floral Display in the Communities in Bloom Competition in Canada. Judges visited Aberdeen, Scotland in July to judge the floral displays. As well as Canadian entrants there was also stiff competition from US and other UK entrants The award of a granite vase was collected by Aberdeen Councillor Mr Ron Clark in New Brunswick.